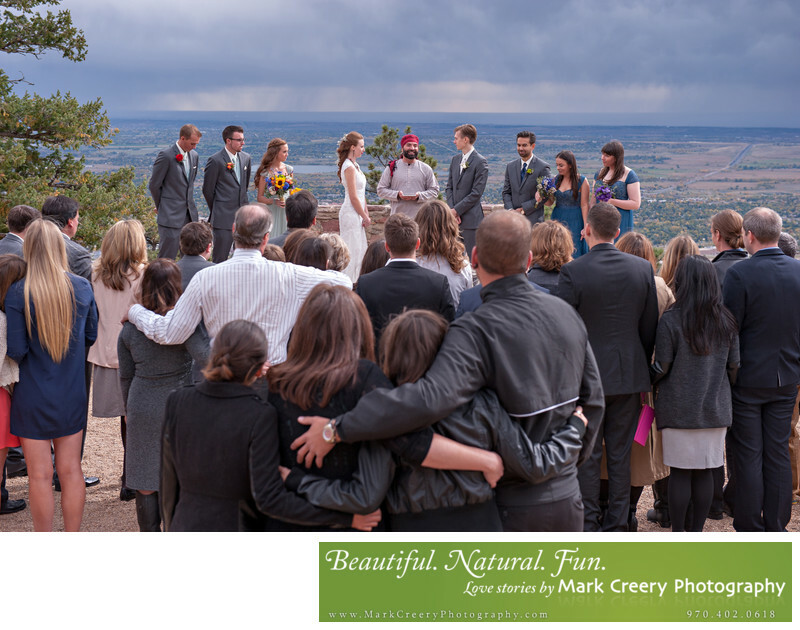 Sunrise Amphitheater is an amazing wedding ceremony venue located on Flagstaff Mountain overlooking Boulder below. Built in the 1930's using local stone, the amphitheater has a rustic feeling and is surrounded by mature pine trees. It has a large semi-circle for seating up to 150 guests and a small stage for the ceremony to take place. The large number of steps leading down to the stage from the parking lot creates a dramatic entrance for the bridal party and the bride. I sure had goosebumps watching Taylor coming down with her dad, even though I was working at the time! I love this photo I took at Taylor and Sam's wedding for many reasons. One is the joy on the officiant's face, who was the one of the most genuinely happy people I've met, and this image reminds me of how beautiful the whole ceremony was. Another reason is the brooding sky giving us a show in the background, with the heavy thunderstorms skirting past us enough to just leave us with lots of wind but no rain. Also, the love the guests had for the couple was very apparent, which I can feel when seeing them huddled together with their arms around each other. Sunrise Amphitheater can be booked through the City of Boulder and is located on Flagstaff Mountain in Boulder. Location: 1198 Flagstaff Dr, Boulder, CO 80302.